When unsightly, old and damaged concrete is no longer acceptable the option for concrete resurfacing should be your top choice. Concrete over time will often develop cracks, show surface spalling, stain, and begin to deteriorate. Most often the structural concrete slab itself is fine but its surface is in need of repair and resurfacing. Our Specialty Flooring Systems have been leading the concrete resurfacing industry for decades and we have a wide variety of products and systems to choose from. Once it has been determined that something needs to be done about the old concrete, the fun begins! 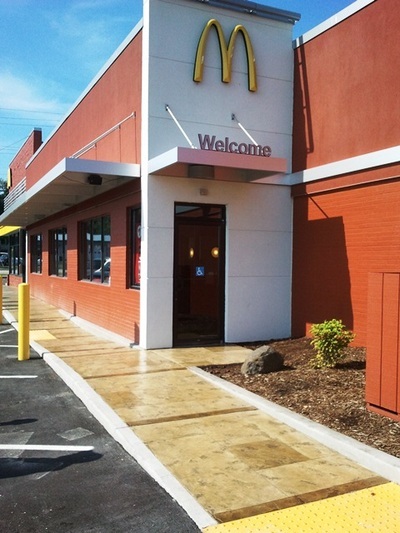 Concrete resurfacing systems open the door to wide range of design and decor options. There are purely functional concrete resurfacing products that will look and feel similar to standard grey concrete, but for those who want to take their concrete to whole new level, it is the decorative concrete systems you should be considering. 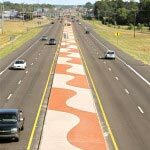 Broom Finish Concrete – Skim, Bond or Broom Coat: This system is designed to resurface concrete with a very thin layer of polymer modified cement. This thin layer can be squeegeed and smoothed out at 1/8th inch thick or less to provide a vibrant new surface to damaged concrete. Because of its thin nature the concrete should be patched and leveled prior to the application so that any imperfections are corrected. This product can be colored and applied with a variety of textures to create an endless, cost-effective means to beautify concrete slabs and floors. Splatter Texture- Splatter, Knock down, Sprayed texture concrete: Often found around pool decks and large outdoor patios and walkways. This functional concrete resurfacing system provides a textured, slip resistant finish that can be efficiently applied with a hopper spray gun. The final look is that similar to a splattered wall finish standard in many homes. The texture helps the surface stay cool for bare feet in the hot sun and creates functional anti-slip surface for wet areas. This texture is most often installed on top of a Skim or Bond coat and can then be coated in any color similar to a painted surface top provide a sealed consistent floor finish. Thin Stamped Overlay – Stamped topping, Stamped concrete overlay, Texture Pave: When a natural custom look is what you are after, a thin stamped overlay will provide a new surface to your concrete that resembles Stone, Rock, Slate or even Wood. When resurfacing concrete with a thin stamped overlay you can expect to cover the concrete with 3/16” to 5/8” of material and then imprint or stamp a pattern into the freshly placed material. When using thin stamped materials you are limited to thin, or shallow stamp mats that require only minimal material displacement. These systems are ideal for interior and exterior spaces where a textured finish is desired that resembles a natural material or paver. Surface Textures: Stone, Brick, Rock, Wood, Pavers. Also includes a range of Anti Slip Additives that can be incorporated in to the sealer system.